Finding good doctors is so frustrating. The one that is good for one person, may not be good for another person. I have also found that sometimes a friend will rave about their doctor and then I find out later that they had serious problems that their doctor was ignoring. I have also found that some of my best doctors were “the worst doctor” someone else has ever seen. There have been times that I have asked for a referral from a doctor only to find that it was not a good choice at all. There are so many things that come into play here. Taking hydrocortisone – seems like a lifelong thing for so many of us! I’ve been taking it for over 20 years, every day. I have been taking hydrocortisone for almost a year now and I have to do a 24 hour urine free cortisol. This is old hat *boom boom chick* for me. I went to the lab yesterday to pick up the jugs. Yes, you heard right – JUGS. Plural. I did these all of the time when I was testing for Cushing’s and after. I usually try to restrict how much I drink but I am really uncomfortable on tests that I get it all in 1 jug. I really need 2 and could easily have done 3 before. The technician was shocked when I asked for multiple jugs and told me that I could just bring it in something else because she really only needs to know the volume and can take the aliquot out of the one jug with acid in it. Rare Disease Legislative Advocates is pleased to open nominations for the 5th Annual RareVoice Awards, a celebration to honor advocates who give rare disease patients a voice on Capitol Hill and in state government. If you know of someone who has been a “Voice” for the rare disease community and should be honored for their work, please click here to submit your nomination. RareVoice Award nominations are open to the public. We encourage the community to nominate individuals and organizations who have gone above and beyond to become rare disease policy leaders and political advocates in their state and our nation. We have nominations open for the following categories: Congressional Staff, Patient Advocate or Patient Organization (at the state or federal level), and Government Agency Staff. Deadline to submit nominations is July 31, 2016. 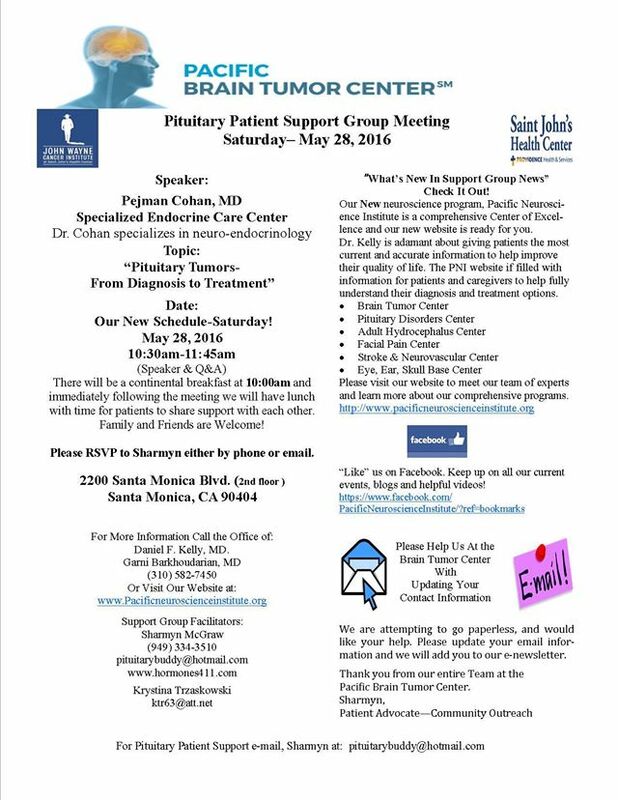 Pituitary Patient Support Group Meeting, Saturday May 28, 2016. There will be time for Q&A and lunch served after the meeting. Free parking with validation, behind building in the JWCI parking lot. Come and enjoy an array of refreshments or have coffee and snack break while learning about the role of our health agencies. Lots of Cushies go to this meeting. Dr. Theodore Friedman (Dr. F) will be one of the speakers. Download the 2016 Convention Program by Clicking Here. Please contact your local travel agent or search the internet for the most reasonable price. Be sure to search often and book early as great fares sometimes become available. The airport of choice is O’Hare (ORD) which is located closer to the hotel. Midway (MDW) is in Chicago also but a distance from the hotel. Please read “hotel transportation” below before booking a flight to Midway. Free shuttle service is provided by Windy City Limo’s to the Westin Lombard from O’Hare Airport only! The shuttle schedule is as follows: O’Hare Airport to the Westin – Thursday – 11 am, 1 pm, 3 pm, 5 pm and 7 pm Westin to O’Hare Airport – Sunday – Pickups at 8 am, 10 am, noon, 2 pm and 4 pm Shuttle buses will have a MAGIC sign in the window and will pick up at the following O’Hare locations: Terminal 1, Door 1G * Terminal 2, Door 2E * Terminal 3, Door 3G * Int’l Terminal, Door 5E Pick up will be in the middle aisle when you exit the doors from baggage claim. If you are unable to find the shuttle, you can contact Windy City at 866-949-4639. You may choose to arrive at Midway Airport but there is no free transportation available and a taxi will cost approximately $40.